Elijah Streams: Demontae Edmonds: "The Gift of Discerning of Spirits & 7 Dimensions of Revelation"
Many of you may be like me in that, you like to have secret information FROM THE LORD HIMSELF while you are doing ministry. Well, you're in Holy Spirit-filled "luck!" There is a whole class of spiritual gifts that are now "here to help!" In very recent years past, it was not uncommon, while doing ministry - especially deliverance ministry - for the one doing the deliverance ministry to have to "guess" at what demonic structures were harassing a person. At such times the pastor or intercessor calls out the many POSSIBLE demons a person might be fighting against. During this season on earth, God is moving VERY quickly to unveil to many hundreds of thousands of His people — He has already given a special gift — THE GIFT OF DISCERNMENT. Please watch and enjoy this interview I did with Demontae Edmonds. Demontae has that same gift - the Gift of Discernment. You're going to love this gift!! Enjoy this episode and special products from the Demontae Edmonds! To view and order his products click here! You would never get behind the wheel of a car if you were blind! So why would you consider one more moment as if you were "spiritually blind!" Well, that can stop right now! 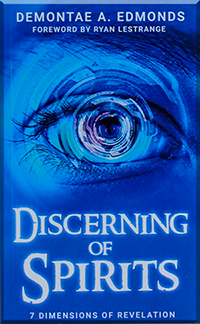 Call 866-967-3665 and ask for: "Learn How to Discern! The Gift of Discerning of Spirits and 7 Dimensions of Revelation" made exclusively just for you, our Elijah Streams viewer. 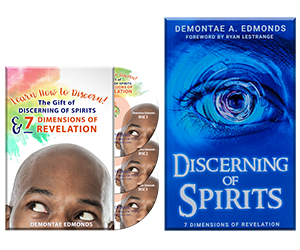 In this deeply insightful package, you'll receive Demontae Edmonds' book, Discerning of Spirits: Seven Dimensions of Revelation, and how YOU can thwart the enemy's plans over you, your loved ones and your business. You'll also receive 3 audio CDs giving you a "foundational teaching" on the Gift of Discernment. Demontae reveals to you 7 dimensions encompassing the Discerning of Spirits including: The angelic, The demonic, The human spirit and more! Whether you're "In the Trenches" or "Behind the Scenes" — this package has something that will change your life! 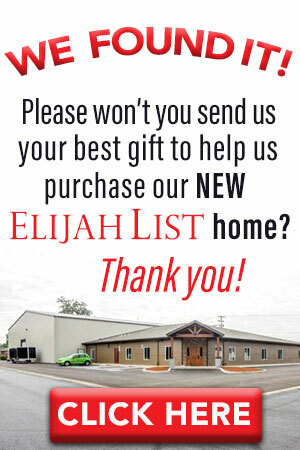 This is made available exclusively for you, our Elijah Streams viewer, for a donation of just $39 dollars.